How do I set up scoring in my own Outcome Measures? 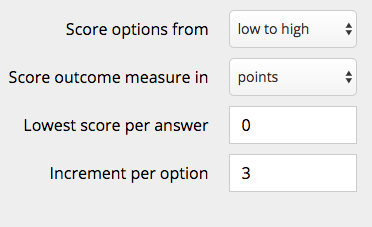 or select the score for each answer in each question. Chose whether the questions will score low to high or high to low, and whether they will be scored numerically or as a percentage. For multiple choice question, chose the increments by which you would like all these answers to increase or decrease. Click " Save". You will be able to view these changes in the "Question scoring" tab. You may wish to create sub-scores from your questionnaire from the grouping of certain questions. 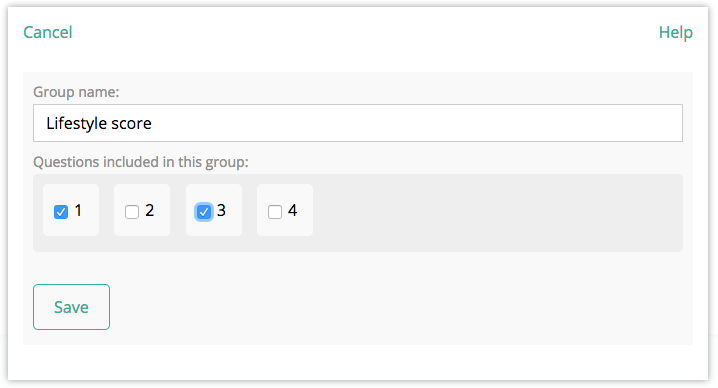 Simply go into " Question grouping" and click "Add question group". This allows you to give the sub-group a title, and select the questions whose scores will be combined in this sub-category. Perhaps you do not wish for all of your answers to be scored the same. Using the " Question scoring" tab allows you to bespoke the scoring for each of your questions. Questions scored as a range are fixed, but those using multiple choice can be changed. Click " Save" to remember these changes. For more information to how to view outcome measure data, and how to create your own questionnaire, watch our pre-recorded webinar. How do I create a new outcome measure? How do I view overall survey results? How do I view and save my client's outcome measure results? How do I export outcomes data?